Who Gains from Dow 20,000? The Dow Jones Industrial Average reached 20,000 points today. Stock values have been rising consistently since Donald Trump was elected. But only 52 percent of Americans have money in the stock market, matching the lowest rate in 19 years, according to a Gallup Poll from April. In 2007, according to that same poll, 65 percent reported investing in the market. Based on those Gallup numbers, many Americans lost faith in the market at exactly the wrong time — just as it was staging a powerful comeback. 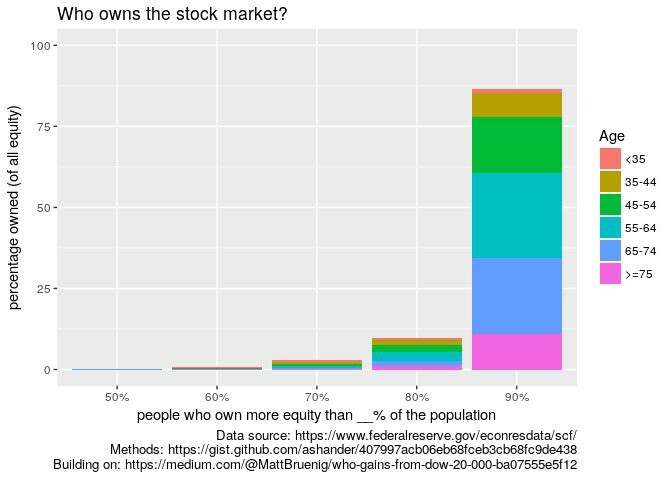 Looking at the number of Americans who own stock does not tell the whole story. To get the complete picture, it is necessary to determine how stock assets are distributed overall. 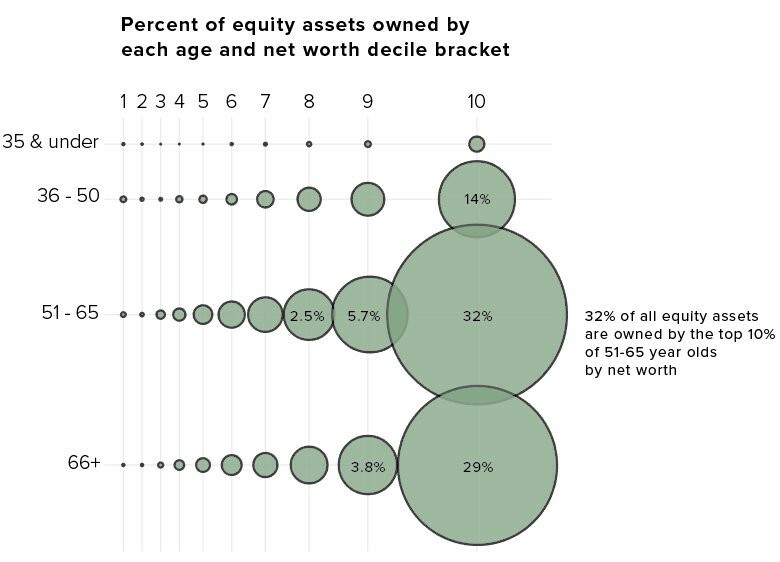 I used the 2013 Survey of Consumer Finances to calculate the distribution of equity assets broken down by equity deciles. The top 10% hold 86.8% of all the equity. The next 10% owns 9.5% of all the equity. The rest own little to none of the equity. The definition of equity I use is explained here and includes directly-held stock, mutual funds, IRAs, and 401ks, among other ownership instruments. 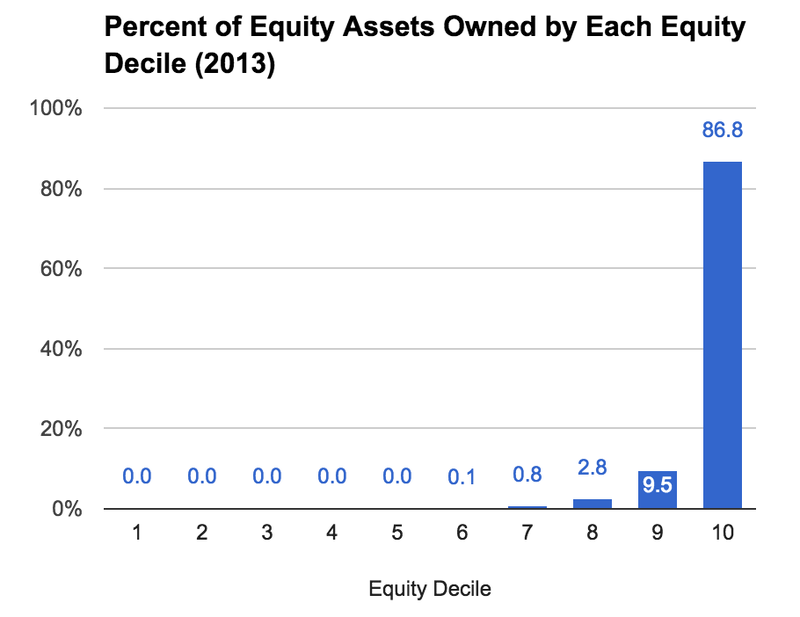 Here are some additional graphs detailing who owns all the equity. Jaime Ashander (@jaimedash) produced the same calculation from the original post (equity distribution by equity decile), but he also added age groups to each decile bar. Ashander tells me he got the same overall results as I did, which is reassuring. 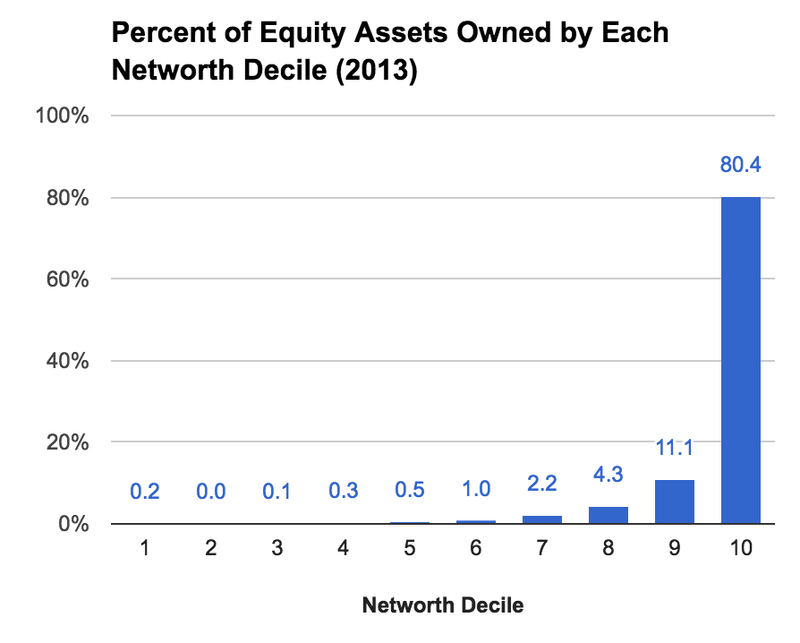 I made a second calculation of the distribution of equity assets, this time broken down by networth deciles rather than equity deciles. It shows that the wealthiest 10% own 80.4% of all the equity. Jake Mortenson (@jm0rt) asked me to break the above graph down by age groups. I did that and then Politico’s Tucker Doherty (@tucker_doherty) produced this visualization of it. 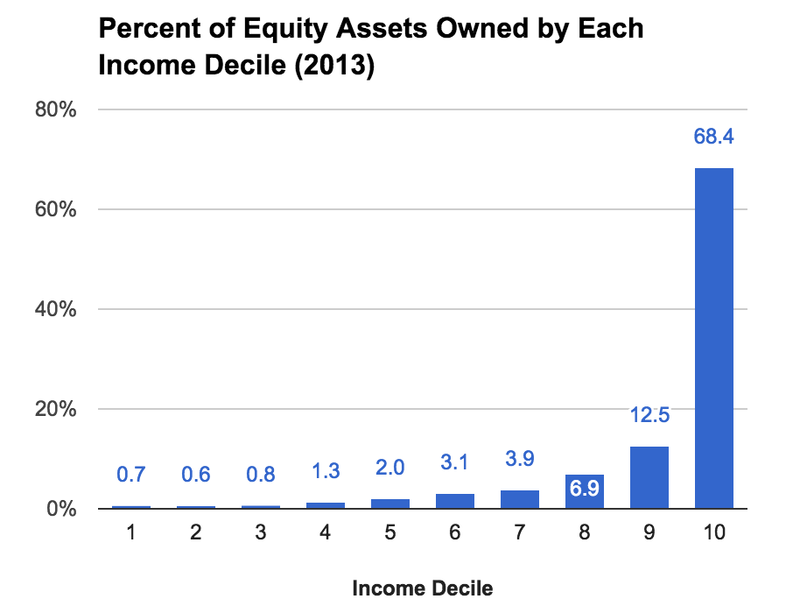 Finally, here is equity ownership broken down by income deciles.